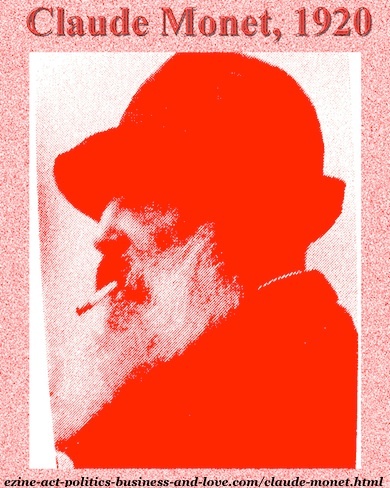 Claude Monet - The Impressionist French Painter's Artworks in Posters and Prose! 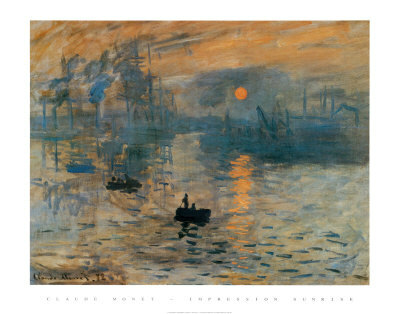 Claude Monet's Artworks are Inspirational! The French impressionist painter Claude Monet has many attracting paintings that cross the French borders to be sold by millions of dollars nowadays. His paintings even appear on books with tons of reviews and stories about the creation moments Claude Monet found himself indulged in to paint. Many paintings come with critiques on those books. Mixed colors smoky silhouette portrait, of the French impressionist painter, Monet Claude. Art schools and colleges use his paintings and his techniques and styles to educate fine arts students in so many countries spanning from Eastern Asia to America. I read about the French impressionist painter with other international painters, musicians, actors and writers while I was in the high school during the 1970s. 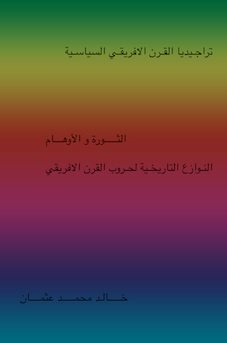 This literary reading was started in fact while I was in the elementary and intermediate school during the late 1960s, when I read to the Parnasian poets Rimbaud and Verlaine. 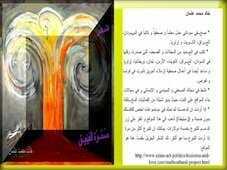 Their story was in a book I received as a gift from the Sudanese artist painter Hashim Mohammed Mohammed Salih. I read at the same period to some other novelists, such as Victor Hugo, as I read to the novelist of the crime drama series, Sir Arthur Conan Doyle, the author of Sherlock Holmes and the novelist of the the detective crime fiction Morris Leblanc, the author of Arsène Lupin. So, the literary orientation was the passion that drives me since that time to follow the international arts, literature and cultures. In 17 April 1984, the Korean painter, Hang Chung Yob told me that he has not been impressed by the French painter and his fellow impressionists, but he liked their artworks. I could feel some impressions on his art, when I viewed the paintings he brought to his exhibition. So I asked him to explain that reflection of impressionism in his works. He replied saying that every body sees arts by different eyes and therefore, some viewers could be impressed by some of his paintings. I lost the art and cultural reports I published on the newspaper at that time. I saw also the reflection of this impression in some other artworks in some exhibitions I covered or wrote about, during my coverage to the fine arts exhibitions of the female artist Salma Arusto, artist Isam Barhomi, artist Mohammed Al-Hadidi, Artist Tahir Al-Azawi and artist Salah El-Deen Tahir. Claude Monet, Water Lilies, Les Nympheas, Study of the Morning Water. In addition to Henri Matisse, I considered Monet as a genius that time and I am still looking at the French impressionist as my favorite painter. It was hard time for Claude Monet to work all those pieces of arts while he was sometimes starving. Despite that he fought hard to impose his new method in an era where people did not realize the values of impression in arts. Luckily, the first painting of Claude Monet grabbed the attention of a journalist and art critic who was working in the French satirical newspaper "Le Charivari" and enticed him to write about the new expression in that art. When Monet finished the last touches on his painting "Solleil levant" or "Impression Sunrise", the French painter, playwright and critic Louis Leroy wrote in 25 April 1874 "L'Exposition des Impressionistes" in the French satirical newspaper "Le Charivari". 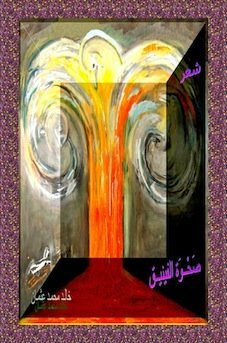 He used the name of the painting to write the title of his article and to explore this new movement. It is that expression “impressionist” which refers to the artists who were known as influential from the first look at their artworks, which impress the viewer. The Magpie, 1869, French painter, Claude Monet. He enlightened the audience by his reviews and opinions and raised the public opinion by encouraging the audience to urge, understand and accept this kind of art. Starting from that point, Claude Monet has marked the birth of the artistic movement, The Impressionists. However, Monet was not the first impressionist to paint using this style. But, he of course helped the other impressionists to be recognized by his paintings. That is because when the Impressionist painters presented their artworks to the public in the 1870s before the acclaimed critic wrote his article the public rejected them. When the public read the article and the discussions raised, they came realized what they need to look again at such kind of arts. 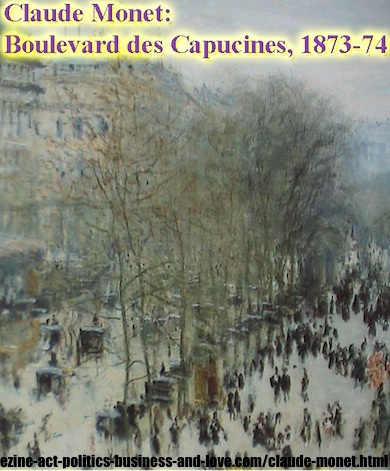 Boulevard des Capucines, French painter, Claude Monet, 1873-74. Since that date, the artistic movement of the Impressionists had established itself, pointed the new arts way forward by the turn of the century, and then enjoyed great interests from the public up to the present days. The critics and the public regarded Claude Monet as the most important Impressionist, when his landscapes rocked their feelings and embodied their thoughts in the Impressionist paintings. The Impressionism as a theory in arts states that we do not see an object as such and just an object, but rather the light in which it appears to us. For instance, Monet painted the portal of Rouen Cathedral at various times of day and under different weather conditions. Those paintings of the Cathedral together make us feel how the changing light affects its appearance. The ever-changing, ever-moving spectacle of the sea had fascinated Claude Monet since his childhood in Le Havre. Therefore, he used to return continuously to the coast of Normandy in order to paint there. Corner of the Pond at Giverny, Claude Monet, 1918-19. Such posters earn you additional income. 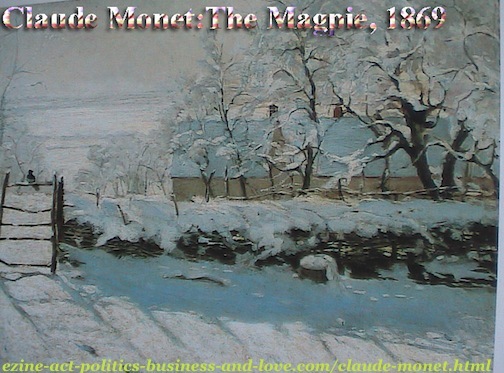 Claude Monet had much concerns to give permanency via the picture to the instant of a particular natural manifestation. He executed his paintings of the sea and of his motifs - landscapes, flowers and ultimately the water lilies in his best pictures from Giverny - to impose such concerns. It was in his opinion that was "the task of the artist to represent what stands between the object and the artist, which is the beauty of the atmosphere, the impossible." Through his paintings, Claude Monet was to come closer to this – unattainable – aim than almost anyone else did. 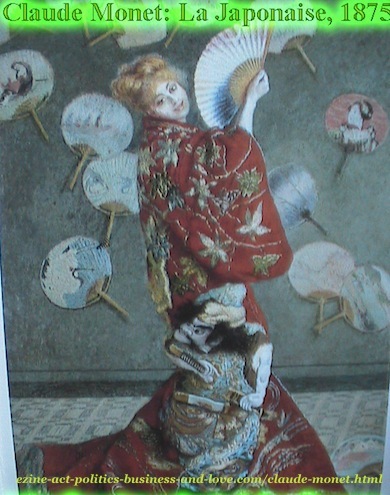 Claude Monet, La Japonaise, 1875. 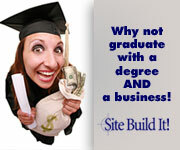 Poster make your website beautiful, attract traffic and earn you additional income. When looking at his artworks, the viewers could see that there is no other French artist in that period who was able to capture the light itself on canvas. Well, some critics said Turner did that. Paul Cézanne said about this ability and about the artist himself, "only an eye, but my God what an eye!" That's said here, Claude Monet found himself connected to the fidelity of visual sensation, when painting from the direct object infront of him. During his first experiments, he explored the components of colors to reinvent the possiblities of using them in different ways to reflect that impression on himself. He started this since the first day he became interested in the Japanese colors in their prints. One of the critics wrote, through "his his time in the dazzling light of Algeria as a conscript, or his personal acquaintance with the major painters of the late 1800s, what Monet produced throughout his long life would change forever the way we perceive both the natural world and its attendant phenomena". 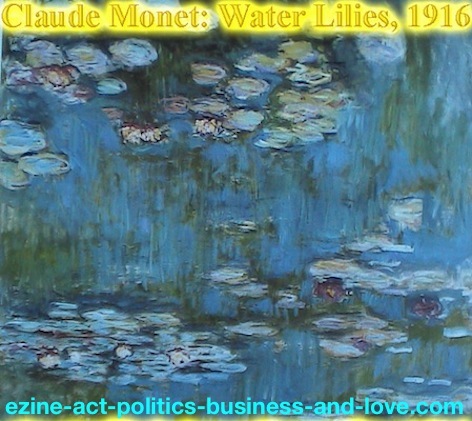 "The high point of his explorations were the late series of waterlilies, painted in his own garden at Giverny, that, in their moves towards almost total formlessness, are really the origin of abstract art", he added. Elizabeth Murray has more to say about Claude Monet in her complete, revised and best-selling book, "Monet's Passion: Ideas, Inspiration, and Insights from the Painter's Gardens". 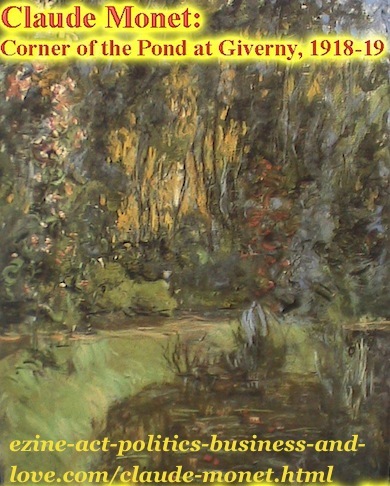 The book is in prose, new images, and new garden plans based on the painter's spectacular gardens at Giverny. The author of the book took this passion as gardener and artist. So, there are two angles through which she explores her topic. Murray had played a role o restore the Giverny gardens in the 1980s and has since enjoyed privileged access to the sight. One of her usual activities is to visit the area annually to capture Monet's passion at its most radiant and riotous. She discusses in her book the development and history of Monet's Giverny estate and brings new insights to Monet's approach regarding gardening and design. She emphasizes his keen understanding of color balance and his genius for maximizing the effects of light. She explores the favorite color combinations and techniques with which Monet experimented in both painting and gardening. Claude Monet's Garden at Vetheuil, 1881. Get posters to make your site beautiful. In addition, with her photographs, she chronicles the garden in present days, and she explains her ideas in a section on Giverny-based garden plans that can be applied anywhere. Impressionist French Painter Monet! Khalid Osman's Video Production! If you love them, you can get some of their paintings here. If you liked this and wanted to develop a fine art passion making it an online business, just ask me, or one of my colleagues. Read more about the Online Free Consulting Services. If you found this page about Claude Monet useful, please do like or tweet it or pin the pictures using the small buttons you see on the page. Thanks. 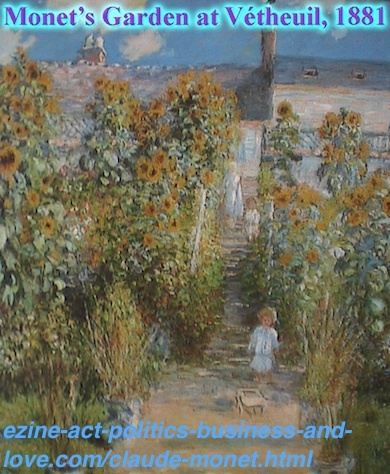 Comments on the French impressionist painter CLAUDE MONET or his paintings appear at the Ezine Acts Comments. Comments on other businesses including the Ezine Acts Home Business and the Ezine Acts Offline Businesses appear at the Ezine Acts Comment C2 Entries, Second Section of the Comments and Zines Commentaries. The Ezine Acts Love Commentaries submitted through Love Consulting Services, Online Love Consulting and Online Love Consulting Services appear at the Ezine Acts Love Entries, Ezine Acts Love Stories and Ezine Acts Sentimental Stories.